Coffee-Mate Creamer Packets in bulk 1000 count box. Stores well, keeps well. Upgrading from "less expensive" powder creamer to Coffee-Mate powder creamer is the single least expensive way to enhance your coffee program (although, nothing beats our liquid creamers!!). If powdered creamer is your choice, do yourself a favor and try Coffee Mate Powdered creamer. You (and your associates) will be glad you did. It is that much better!! 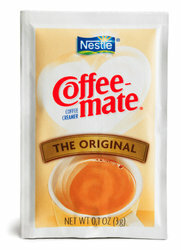 Coffee-Mate Creamer Packets. Comes in the cost reducing 1000 count bulk case.